1947-1987 Stealth Tailgate Latches (Stainless) - GM Truck Stepside Tailgate Latches (Stainless Steel) - UniversalSold in pairs. 1954-1959 Stepside Tailgate Link Kit - GM Truck This Tailgate Link Kit eliminates the use of chains on your tailgate. 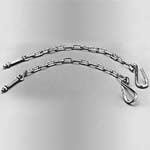 1954-1987 Tailgate Chain Cover (Black) - Universal - Universal This will keep your chains from scratching your paint. Steve Egolf shared a post. 5 hrs · I never thought that I would see something that I put together in a advertisement but here it is, I would like to thank Tuckers Classic Auto Parts for choosing my truck , I am very thankful .